Long story short, there's not really an underlying story for this poster. This is an intentionally derivative work; a nod to the dystopian sci-fi noir of the 80/90s when everyone imaged the future wrtten in neon kanji. To be honest, the timeline on development was a little rushed, and I like a many aspects, but this is clearly the least polished of the three posters. The original idea for the three posters were Noah: The Culling, The Longest Game, and a third poster based on Leave it to Beaver meets Die Hard called to do a poster for Mr. Habits, but there wasn't sufficient time/budget to develop all the necessary assets, and so we had to slot in a new third without as much time to develop the concept. That being said, I love the title and tagline. 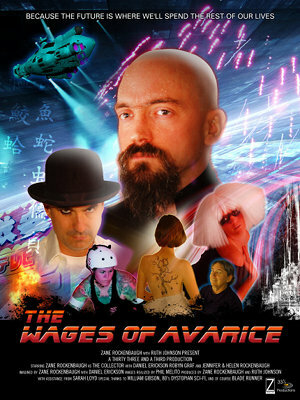 The title, incidentally, was inspired by the classic thriller, The Wages of Fear. There's three other deliberate and direct references in the image, which I leave as an excercise to the reader.